StyleLink is Matrix new line of products designed to be mixed and matched according to what your style needs. 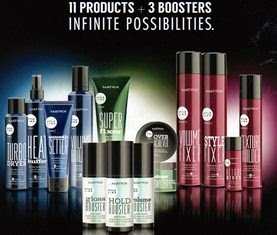 Whether you want big volume with shine, smooth & glossy, or a textured style, there is a recipe of StyleLink products that make it much easier to achieve the perfect look. Step 1 is your foundation (blue), step 2 is your texture/hold (green) and step 3 is your finish (red), plus three boosters (gloss, hold, and volume) when you want a little more. The videos below shows you how to achieve full volume curls and how to get texture & volume to a short men's style.